Ba soccer fans can be rest assured as their top marksman, Abbu Zahid is going nowhere and will stay with the Men in Black for the whole season. In an interview with Fijivillage this afternoon, the 27-year-old has confirmed that he will withdraw the application to join Lautoka in the player transfer window. This will be done tomorrow. Zahid who has links to Vatulaulau in Ba scored 12 goals in last years Vodafone Premier League and guided Ba to clinch yet another BOG title last year by scoring six goals. 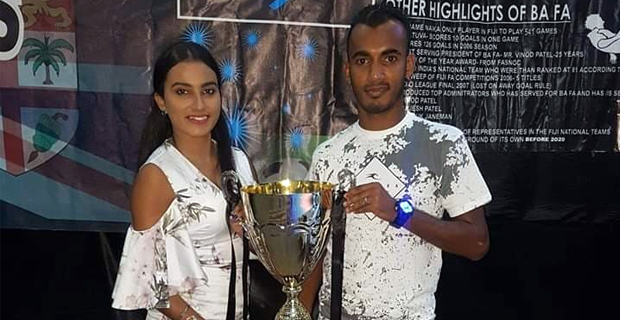 A lot of talk was generated in the last two weeks about Zahid switching districts and joining a star studded Lautoka team but the former student of Lautoka Muslim College, Drasa Secondary School and Ba Sangam College says that he will continue his soccer career with Ba. Ba will definitely be a team to watch this season with Zahid deciding to stay back and players like Ratu Dau, William Valentine and Mohammed Sazil also joining the Men in Black. Ba will face Nasinu this Sunday at Ratu Cakobau Park in the Vodafone Premier League and will then take on Labasa next Saturday at Subrail Park. This match will officially start the 2019 VPL season. Meanwhile, defending champions Lautoka will play Tavua this Sunday at Churchill Park.